1. 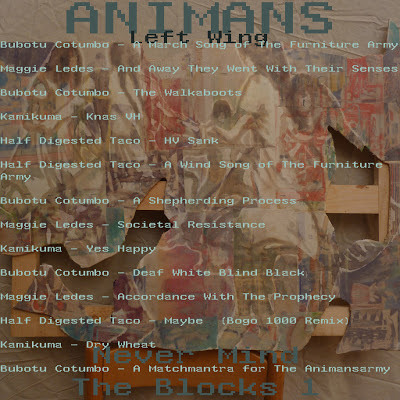 Kamikuma plays Animans, Initiation, while watching videos with Zizek and Dolar. "One divides into two, two doesn't merge into one" is an old maoist slogan not many people recognize today. Antagonism between the classes, inherent in the capitalist system , unavoidably leads to class struggle and cannot be reconciled within the existing system. The reconciliation is only possible in a new order, in a synthesis different from the initial One. Why I am referring to that slogan, which is also the topic of the conference I am watching, when my intention is to discuss the album, is understandable: I think the album is a celebration of the split. 2. Kamikuma discovers God, but he doesn't exist. Hegelian triad of thesis-antithesis- synthesis, summing up what I said so far, can be replaced by " being- nothingness- becoming" , nothingness or the void as the source of movement. When things are pushed closer to the void or virtuality, a becoming is about to take place. Very incorrect to use Deleusian terminology here, as his concept of virtuality never leaves the material plane, while Hegel being an idealist reaches out to God in his statement that the universe is incomplete, but somehow I feel that it's legitimate, as I imagine that universal force called God as feminine, it is not a father-figure, a master, but a mother hiding somewhere among the ordinary things. Nature as mother or Mother-nature...The umbilical cord is severed, but we need a re-link (religio). Nature comes first as Hegel himself would certainly agree. The gap is in the substance, there is an unrest or disquiet in all being, expressing itself as potentiality of war or madness. Hegel is often criticised for negativity, but actually his negations ( and the album is full of them: anti-music, anti-rhythm) lead to a new positivity by pushing the limits of the thing negated. Anti-music is not the same as not music. And anti- is not only a marker of the alternative, standing ouside of the music market, of DIY aesthetics and cooperative spirit of punk, noise, no-fi, discordant sound. It is also an affirmation of music that misbehaves, acting like a clinamen, a singularity of space. The problems I experienced with some tracks of Initiation ( which made it a very traumatic passage) were not on the level of time-form, but on that of a musical gesture. It just didn't make sense to me what the combined tracks were doing there in relation to each other- I found none, and when the mind in its attempt of finding a relation fails, it runs into irreducibility of the two . It's Lacanian antinomy of One that splits into itself and the void or the Other ( One already posterior to a split). This is exactly how the songs of Initiation are made- each splits into itself and the x, then a new cut is made and again a split into itself and the x, occupied by the Other. They don't merge into one, but remain two separate lego pieces: so the gap is maintained and I had to find an abstract midpoint in my mind, creating an oscillation between the tracks and finally a new parallax mode of listening. 4. Kamikuma's new theory of gender. I find the support and explanation of my reaction in Lacan's classical "il n'y a pas de rapport sexuel- there is no sexual relationship,...the woman doesn't exist", provoking the anger of feminists, but none the less making me believe in love and in Lacan as well as Hegel as philosophers of love ( It was Zizek who pointed at that), because through the experience of love you have to meet the otherness in yourself - it is something that shatters you out of your own existence. Probably in a woman that otherness occupies the first place, I understand it as universality in relation to a masculine particularity, the conflict of the opposites as a conflict between the universal and the particular within the self, and identity emerging in the gap, depending on where the split takes place. 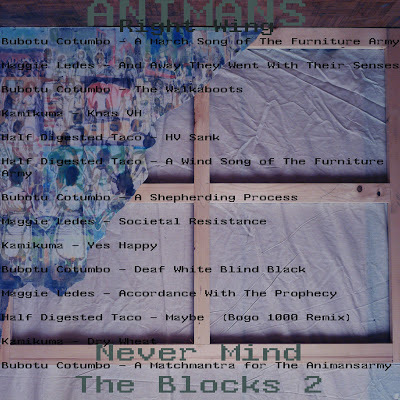 12 & 13- Bubotu Cotumbo- A March Song of The Furniture Army & Half Digested Taco- A Wind Song of The Furniture Army. 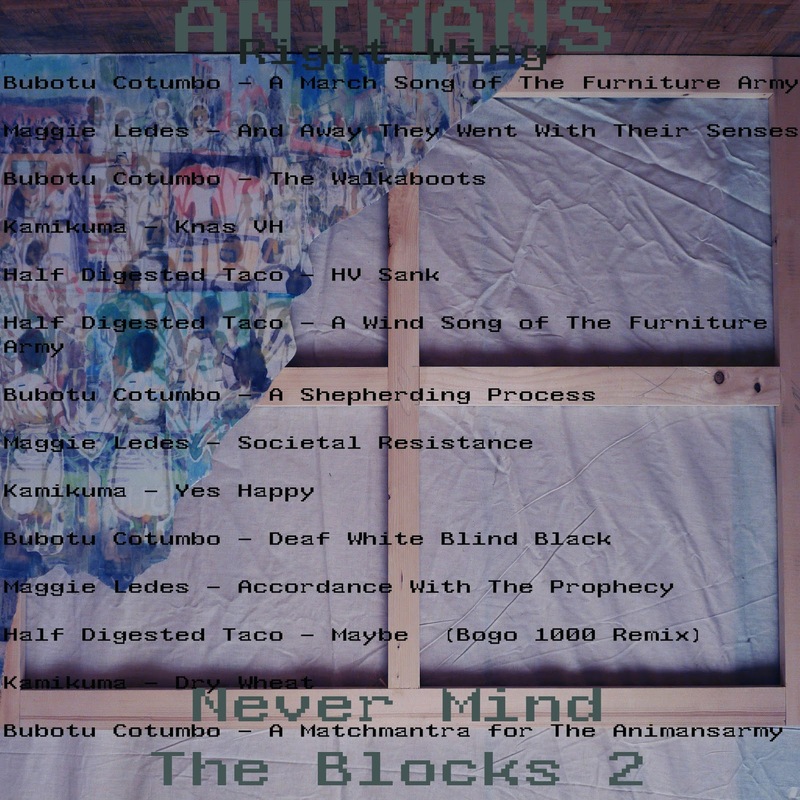 14 & 15- Bubotu Cotumbo- A Shepherding Process & Half Digested Taco- A Wind Song of The Furniture Army. Kandinsky elaborates a system of correspondences between colour and geometrical shape in his theoretical work 'On Spiritual in Art- it serves as a trampoline, allowing him to make a jump into unknown, and relying on his model, he starts eliminating all the hinders. His "Blue Rider", marking a gradual shift to abstract painting is already a patchwork of colour the viewer can enter and then synthesise. In his later works, he separates colour and shape , opening up even more, and in the black and white paintings he only relies on shape, bringing things to their closure or death or silence of a body, which is the meaning of his black. White is all colour, only unmanifested. Colours entering those black and whites in a viewer's perception seem to come from nowhere, it's ephemere like music. What I am describing is a process of initiation with its stages of separation, transition and incorporation in a new order. In other terms it can be called a becoming, like in 'becoming animal' . I already mentioned Beuys and his famous performance. The very first link is in the title: Animans -the word animan (animal-human). In his 'I Like America and America Likes me' he symbolically re-enacts his life experience during the war, when his plane was shot down over the Crimea and he was saved by nomads who smeared his body with wax and fat and wrapped in felt. Beuys gets transported to the place of the performance in the ambulance, covered in grey felt (grey felt is also a depression), and spends several days sharing the room with a wild coyote, using the felt as the only protection. Through this encounter with the other he comes to terms with his past trauma and undergoes a shamanic transformation. A wound cannot be healed through reconciliation of the opposites by simply patching up the gap, only through acknowledging it and letting the ever changing force of nature nurture you. The symbolic value of organic materials like butter and fat as life-saving substances is that of a healing power of nature Beuys strongly believed in. In another work, Wirtschaftswerte ('Economic Values'), he used a block of plaster that had been in his studio for a long time and was full of 'scars'. To correct them he put butter on it and then it got slowly absorbed by the chalk. 7. The Unconscious is structured like the language. Animan ( animal/ human) looks like a slip of the tongue. ( There was another one, more Freudian, forniture, corrected in the final version). Usually it's the unconscious breaking in through the cracks in the language manifesting as slips and other distortions. It was one of the reasons of bringing Lacan here. Sound and language intersect in the split, I am both listening and reading the album and the art work as a text. The concept of the project or a model on which it is build is programmed for deviation. As a cooperative effort it is not vaccinated against mishaps and glitches: it could go wrong -Hegelian totality that includes failure. The maker of the project is a (sound) painter, calling himself Bubotu Cotumbo, located not far from the town of Trieste, but not very close either( ya or nay on the same continent) playing (junk, broken instruments,...) with amazing presence and sensitivity located on a totally different from us continent or not located there due to summer re-location, called Maggie Ledes (MergFromMemphis), with amazing presence somewhere in France, Half Digested Taco and sensitivity, a (sound)painter- maybe not always of France, playing kamikuma of the North (of north-eastern ghettos of Gothenburg playing sound or not playing). figure 1- a double fold of a square (horizontal - HDT to ML, K to BC+ vertical - HDT to K, ML to BC; diagonal left - HDT to BC+ diagonal right - K to ML); figure 2- a new double fold. 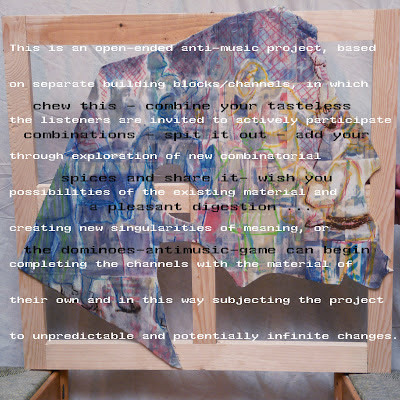 Can be continued ad infinitum, new listeners/users in the corners, contributing or not contributing with own material. No doubts are left to whose art work this is.